Back cover blurb: During the American occupation, the citizens of Japan were encouraged to apply directly to General MacArthur – “if you have a problem, write a letter, this is what democracy means” – and so write they did. MacArthur received over 500,000 letters, letters of entreaty, rage, gratitude, complaint, even adoration. Twelve-year-old Fumi Tanaka has a problem – her beautiful and beloved older sister, Sumiko, has disappeared. Determined to find her, Fumi enlists the help of her new classmate Aya, forcibly repatriated with her father from Canada after the war. Together, they write to MacArthur and deliver their letter into the reluctant hands of Corporal Matt Matsumoto, a Japanese-American GI whose job it is to translate the endless letters. When weeks pass and they hear nothing from Matt, the girls take matters into their own hands, venturing into the dark and dangerous world of the black market and dancehalls. They're unaware that their teacher, Kondo Sensei, moonlights as a translator of love letters, and that he holds the key to Sumiko's safe return. 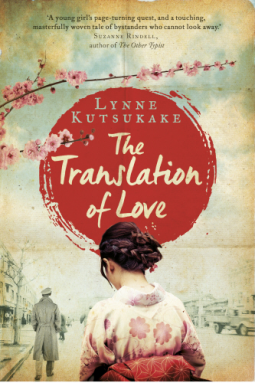 The Translation of Love is Lynne Kutsukake's debut novel about the friendship of two young girls in the aftermath of World War Two, which sees Japan occupied by America. Fumi is Japanese born and her new classmate Aya is Issei (first generation born) Canadian Japanese who spent the war years in an internment camp where she suffered the loss of her Mother to suicide. Fumi's older sister Sumiko hasn't been in contact for many months and Fumi is worried about her. She decides that, with Aya's help, she must write to General MacArthur, after all; "if you have a problem, write a letter, this is what democracy means". Fumi joins the thousands of others who have written to MacArthur, each of them hoping he will help them personally. Matt Matsumato, a Japanese American GI is the man with the unenviable task of translating those letters to be forwarded on to General MacArthur. After a chance meeting with Fumi and Aya in the street outside official offices, Matt agrees to help the girls against his better judgement. Meanwhile Fumi and Aya's school teacher Kondo is assisting those who cannot decipher letters sent to them from their 'loved' ones. In a time of forbidden relationships between young Japanese women and American G.I. 's, Kondo's services are invaluable. The Translation of Love is a lovely debut, and I look forward to reading more from this author in the future. The Translation of Love is now available from Amazon online and all good book shops.